This product is available fully compliant to the RoHS EU directive 2002/95/EC. The D1100 voltage input module is part of the DGH's D1000 sensor to computer interface data acquisition module family. This input module converts voltage input signal from the choice of six different voltage ranges (±10mV, ±100mV, ±1V, ±5V, ±10V and ±100V) and continuously converts the data using the ASCII protocol to give digital output at the rate of 8 conversions per second, storing the latest data in the buffer. The data can be retrieved by.. The D2100 voltage input module is part of the DGH's D2000 sensor to computer interface data acquisition module family. This input module is an enhanced version of the D1100 module with added programmable functions. Similar to D1100 module, the D2100 converts voltage input signal from a choice of six different voltage ranges (±10mV, ±100mV, ±1V, ±5V, ±10V and ±100V,) and continuously converts the data using the ASCII protocol to give digital out.. The D1200 current input module is part of the DGH's D1000 sensor to computer interface data acquisition module family. This input module converts current input signal from the choice of five different current ranges (±10mA, ±1mA, ±100mA, ±1A, and 4-20mA) and continuously converts the data using the ASCII protocol to give digital output at the rate of 8 conversions per second, storing the latest data in the buffer. The data can be retrieved by s.. The D2200 current input module is part of the DGH's D2000 sensor to computer interface data acquisition module family. This input module is an enhanced version of the D1200 module with added programmable functions. Similar to D1200 module, it converts current input signal from the choice of five different current ranges (±10mA, ±1mA, ±100mA, ±1A, and 4-20mA) and continuously converts the data using the ASCII protocol to give digital output at t.. The D1300 thermocouple input module is part of the DGH's D1000 sensor to computer interface data acquisition module family. This input module converts the thermocouple temperature sensor input signal from the choice of 8 different thermocouple types (J, K, T, E, R, S, B and C) to digital data, linearises and scales it in °C or °F, and communicates the values using the ASCII protocol to give digital output. The D1300 thermocouple input module .. The D1400 RTD input module is part of the DGH's D1000 sensor to computer interface data acquisition module family. This input module converts the RTD temperature sensor input signal from the choice of three different RTD types (0.00385, 0.00388 and 0.00392) to digital data, linearises and scales it in °C or °F, and communicates the values using the ASCII protocol to give digital output. The D1400 RTD input module also contains one open-collecto.. The D1500 bridge input module is part of the DGH's D1000 sensor to computer interface data acquisition module family. This input module converts the outputs from load cells, strain gauges or other bridge type sensor input signal to digital data, linearises and scales it in mV, and communicates the values using the ASCII protocol to give digital output. The D1500 bridge input module also contains a digital output (or LO alarm) which may be contr.. The D1600 frequency input module is part of the DGH's D1000 sensor to computer interface data acquisition module family. This input module converts the frequency or pulse sensor input signal to digital data, linearises, scales and communicates the values using the ASCII protocol to give digital output. The D1600 series includes frequency, timer, 60H events counter (20Hz available upon request) and accumulator (combination of frequency/timer wit.. The D1450M thermistor input module is part of the DGH's D1000M Modbus sensor to computer interface data acquisition module family. This input module converts the thermistor temperature sensor input signal from the 2252 Ohm or TD-series thermistor, to digital data, linearises and scales it in °C or °F, and communicates the values using the Modbus RTU protocol to give digital output. The D1450M thermistor input module also contains one digital in.. The D5400 thermistor input module is part of the DGH's D5000 low cost multichannel data acquisition module family. This input module supports up to four channels and converts the thermistor analog input signal to digital data at the rate of 8 conversions per second, then converts the data to engineering units using the lookup tables, storing the latest data in the buffer. Thermocouple type 2252Ω at 25°C is supported. The data can be retrieved b.. 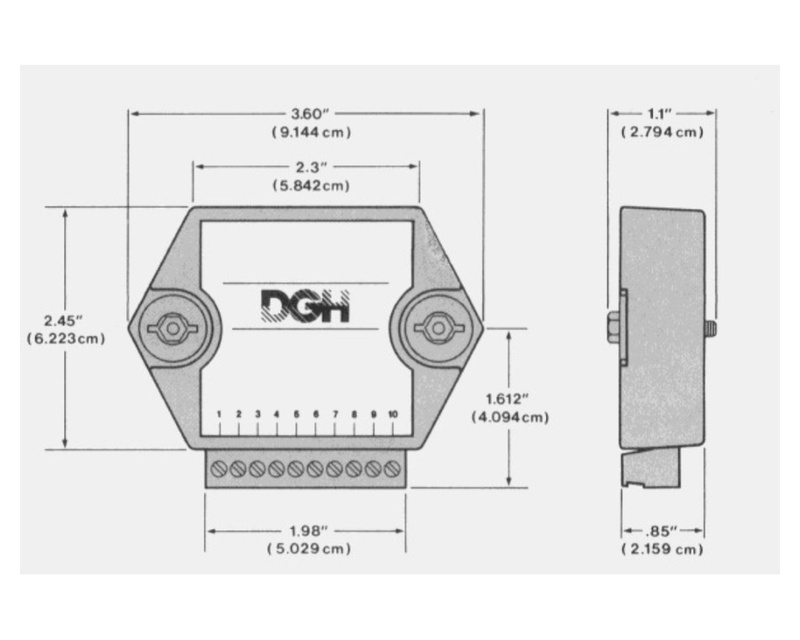 The DIN-145 MODBUS thermistor input modules are part of the DGH's DIN-100 data acquisition module family. This input module converts analog input signal from the choice of two different thermistor types (2252Ω at 25°C or TD series) using the MODBUS RTU protocol to digital data at the rate of 8 conversions per second, storing the latest result in the buffer. The signal is transmitted to the computer or other processor-based controlling equipment..